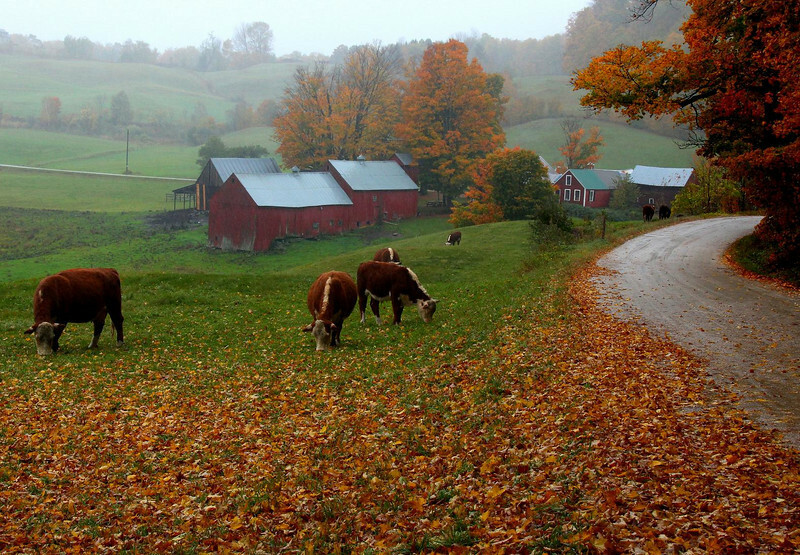 The famous Jenne Farm, Vermont, taken about 5PM. I stood here for about 45 minutes as the cattle slowly moved closer, my car totally blocking the narrow road, and never saw a soul. A cold, steady rain that had fallen since 8AM had me and my "water resistant" coat totally soaked. I was chilled and shivering by this point, but savoring the photo op to the max. The soft patter of rain was the only sound. Normally in October photographers will have to take turns here for this prime viewing spot, but it was all mine for those peaceful moments. A thin but distracting electric fence magically vaporized in editing.